A previous post covered the first issue of The Siren, the school newspaper of Boyle Heights Junior High, soon renamed Hollenbeck Junior High. The second issue, published on 26 October 1922, had a number of interesting components, some of which might be found in a similar publication today. 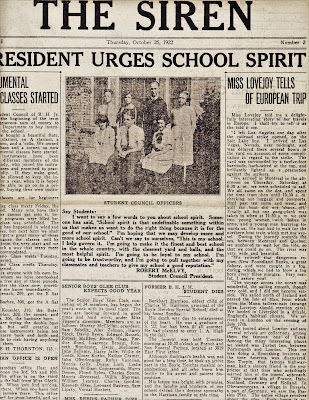 One was a short front-age commentary by student council president Robert McElvy, who noted "I'm hoping that we may develop more and more school spirit" with the goal of having it be "the finest and best school in the whole country, with the cleanest yard and halls, and the most helpful spirit." Calling for loyalty, trustworthiness, and cooperation with fellow students and teachers, McElvy ended with the desire "to give my school a good reputation." 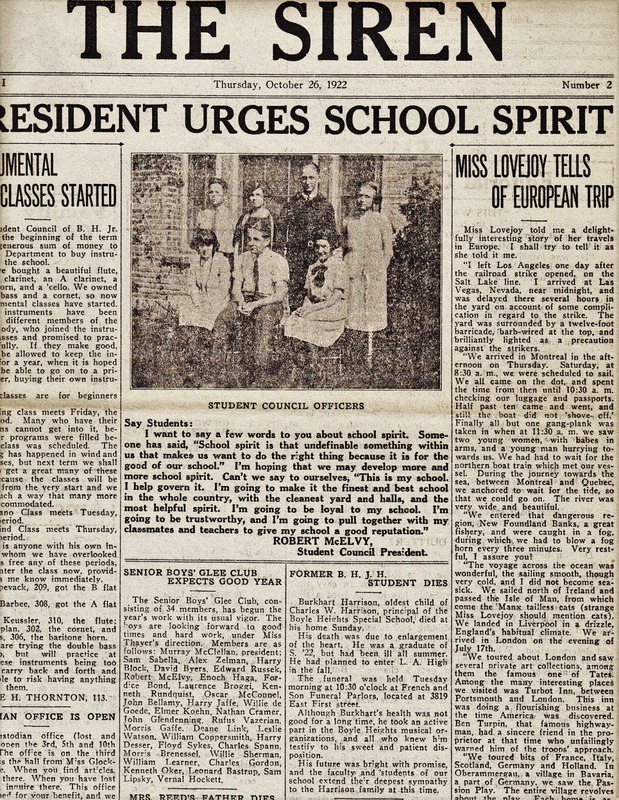 Part of the front page of the second issue of The Siren, the student newspaper of Boyle Heights Junior High School, now Hollenbeck Middle School, 26 October 1922. The original is in the collection of the Workman and Temple Family Homestead Museum, City of Industry. An editorial, probably by Editor-in-Chief Maurice Nathan, lionized former President Theodore Roosevelt, whose birthday is on 27 October, praising him as "one of the biggest men our country has known" and quoting at length a statement by the Roosevelt Memorial Association about the many qualities of the man who "made himself a lion of courage . . . one of the great doers of all times" and who could be "terrible in battle, but tender to the weak." Not surprisingly, a new high school in the works in Boyle Heights, but not opening for another year, was named for the former president and Roosevelt High School is nearing its centennial, which will be in 2023. A portion of page two of the paper showing a cartoon about chasing down graduation, a humorous "Faculty Comment" and other items. Inspirational essays were sprinkled throughout issues of The Siren and there were two in this issue. One asked "Are You a Quitter?" and admonished students not compare themselves with others who they think have the easy life. Instead, the editorial cited the example of another legendary American, Abraham Lincoln, stating, "Lincoln made his chance, and success came to him through his own efforts," intimating the same could happen to any Boyle Heights Junior High student. The second was aimed at "The American Boy" and suggested that "he must not be a coward or a weakling, a bully, a shirk, or a prig." Moreover, "he must work hard and play hard. He must be clean-minded and clean-lived . . ." These quotes, of course, were from Theodore Roosevelt. Another was from Isadore Rozzen, a student who wrote "we have a right to expect that every American boy should become a worthy American citizen," though he cannot become this if "he is always afraid to fight, or if he is a bully picking on smaller boys than himself." Finishing his work and putting "business before pleasure," Rozzen concluded that "if he does this all through his life he will grow up to be a man of whom we all can be proud." As the son of Russian and Polish Jewish emigrants, Rozzen likely represented many fellow students in a community largely composed of immigrants. An essay about "The American Boy", a photo of one of the school's classes, and some ads are featured on this page. Another common feature of any newspaper was the humor section--this one was titled "Rib Ticklers" and included such jokes as: "If Olive Street were moved one block west wouldn't it be Grand?" or "Spaghetti should not be cooked too long—about 10 inches is right" and "How many hairs in a cat's tail? None at all; they're all on the outside." Another item was "The Boyle Heights Movie Theater" in which current film titles were identified with the school, as in "Foolish Daughters" equaled "Our Boyle Heights Flappers"; "The Long Chance" meant "Ditching"; "Blood and Sand" was "A Football Game"; and "Ten Nights in a Barroom" equated "Staying After School With a Mean Teacher." Then, there were sports. In this issue there were lists of soccer teams by class, news about local football, baseball, boxing and other games and contests, including standings for local high school football teams, which had just completed the second week of their season. There was also a "Ten Commandments" of "a good sport," including the first being "Thou shalt not quit," the third being, "Thou shalt not gloat over winning," and its corollary, number four: "Thou shalt not be a rotten loser." A snappy ad from a Boyle Heights restaurant is one of the many found in the paper. Other elements of the eight-page paper were recipes, alumni news, the development of forthcoming music classes, a teacher's account of her European trip the prior summer, ideas for throwing a Halloween party, and news of a "penny drive" to raise money for the PTA's Scholarship Fund. Finally, there were local business advertisements from such enterprises as the Boyle Heights Feed and Fuel Company; J. Rubin's Shoe Repairing Shop; Meyer Bolotin's Barber Shop; B. Sapkin's Hardware Store; the Hollenbeck Pharmacy; Wilson's Flower Shop; the Poppy Theatre (admission 20 cents for adults and 10 cents for children); and even Bede Johnson's undertaking establishment. A stand-out ad, though, was for "The 5 Cent Joint" at 6th and Mathews, which used snappy language and little jokes to grab a junior high student's attention, including the statement that punch came "right from Niagra Falls" being boxer Jack Dempsey's "famous punch" and that "everything is fresh except the cook." This blog will go back periodically and revisit other issues of The Siren so check back and see what all the noise was about. Contribution by Paul R. Spitzzeri, Assistant Director, Workman and Temple Family Homestead Museum, City of Industry. The issue of The Siren is from the museum's collection, which is available for public research. Bound copies of "The Siren" are stored in the school libray. I believe they run to 1945. Andrew Tapia currant library assistant has maintained there safe keeping.